Widely considered one of the most beautiful designs for a circulation coin, the Mercury Dime still holds vast appeal and has become a vehicle for buying and selling silver even though the coin has not been produced since 1945. Minted from 1916 through 1945, the Mercury Dime 10-cent coin was designed by Adolph Weinman and it is also referred to as the Winged Liberty Head dime. 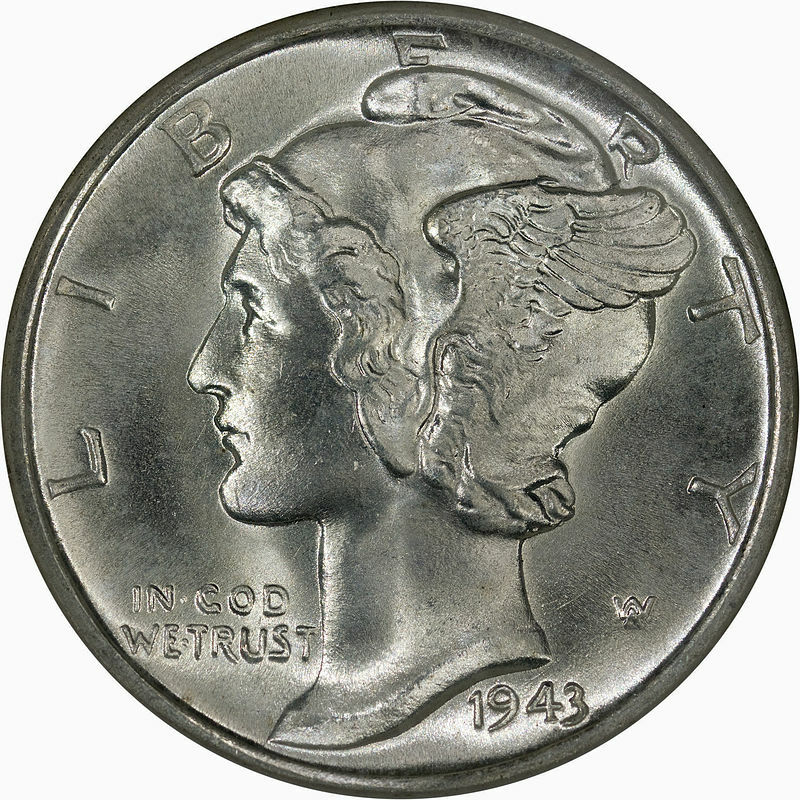 The moniker “Mercury” dime is actually a mistake – because the obverse depicts a young Liberty with a winged Phrygian hat, she was commonly mistaken for the Roman god Mercury. The reverse of the coin features a fasces (a bound bundle of wooden rods) which symbolizes unity and strength while an olive branch wrapping around the fasces represents peace. The coin’s design was very popular amongst the public, but slight design elements had to be changed because vending machine manufacturers were having trouble getting the new coin to work properly. The main reason that Mercury Dimes are so popular today is that they’re a great way to invest in silver. Before 1965, all silver coinage was made with actual silver. As the price of the commodity has risen, the United States Mint couldn’t afford to create coins with silver anymore so present day dimes are made with copper and nickel. But even copper is beginning to become too expensive so there is word that a different metal or alloy will be used to create coinage in the future. All Mercury dimes are composed of silver and copper. 90% silver and 10% copper. Each dime contains 0.07234 troy ounce of silver. It takes roughly 14 mercury dimes to total 1 troy ounce of silver. Because of this silver composition and its widely recognized design, Mercury Dimes and 90% silver have become very popular amongst investors, collectors and even preppers. There is a wide view that if there was an economic collapse that the common method of bartering and trading would become 90% silver. Because the economy collapse, modern day money would be worthless as it is backed by nothing physical, whereas 90% silver contains actual silver and has intrinsic value.